Seattle may have a reputation for gray skies and dreary weather, but don’t let that scare you away from visiting. Each time I’ve traveled to Seattle, sunshine and blue skies have been waiting right around the corner. Since July and August are the sunniest months of year in the Emerald City, I can’t recommend a summer visit enough. 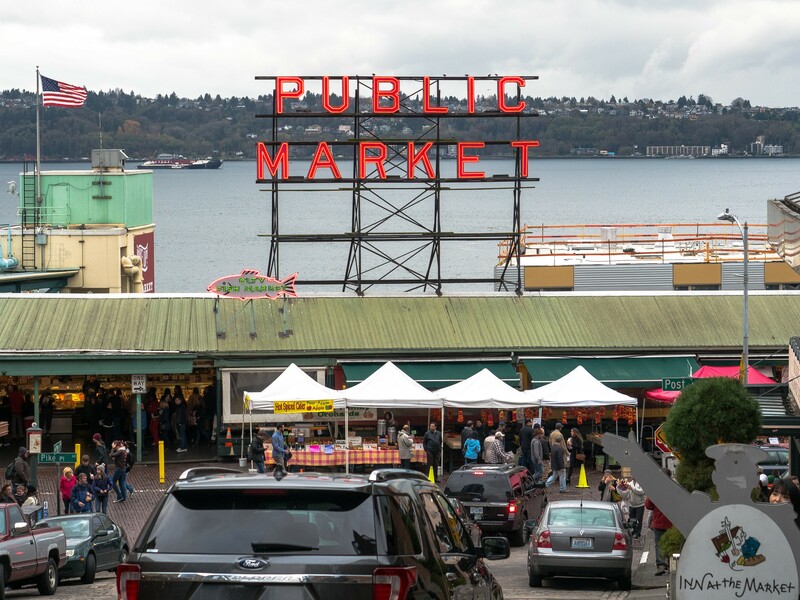 Sprawling markets are some of my favorite spots to spend time in any city, so I love starting any Seattle visit with a walk through Pike Place Market. Here, vendors have sold an impressive range of produce, seafood, flowers and many other goods for over a century. 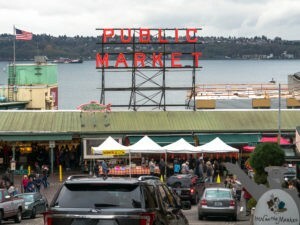 I love picking up some seasonal fruit when I’m here, but even if you aren’t in the market for anything in particular, Pike Place is still a fun hub of activity. While there’s no longer a dedicated gluten-free bakery in Pike Place Market, you don’t have to go far to satisfy your appetite. Just east of the market in Seattle’s vibrant First Hill neighborhood, Niche Gluten-Free Café and Bakery has all the gluten-free goodies you desire. This funky spot is completely gluten free, so you can feel comfortable enjoying anything that catches your fancy. The Paleo-inspired hash bowls, which can come loaded with veggies, Alaskan salmon, Applewood bacon or a veggie burger, are one of the most popular brunch items, while the Niche Club stands out on the sandwich menu. Like a lot of menu items, both of these are dairy free, so they’re great for other allergy-conscious diners, too. My top pick at Niche is the signature Cheesy Egg Waffle-ini. This ingenious invention is a gluten-free waffle sandwich made panini-style to ensure that the cheese is perfectly melted. You can also get yours with Applewood bacon and apple butter or go for a sweet version slathered with Nutella. If you really want to treat yourself, though, save room for one of Niche’s scrumptious homemade ice cream sandwiches, a delightful combination of chocolate chip cookies and vanilla ice cream. Owner and Chef Toby Matasar has over 20 years of experience as a French pastry chef. When she cut gluten out of her diet a few years ago, however, she put her expertise to the test as she experimented with rice and tapioca flours and potato starch. When you visit, you’ll see her creativity shining throughout the menu, whether you’re ordering brunch, lunch or an afternoon pick-me-up. At Niche, you’ll also feel the love. After all, the motto here is “Eat, drink, smile.” Chef Toby opened this intimate spot to feed people well, and Niche’s deliciously gluten-free meals and treats do just that. Seattle boasts some impressive stretches of waterfront, and taking a harbor cruise in Elliott Bay is one of my favorite ways to see the city. If you’d rather stay on dry land, the waterfront is also home to plenty of family-friendly activities, like the Seattle Great Wheel and the Seattle Aquarium. Not far from Elliott Bay, don’t miss some of the city’s top cultural destinations. The Seattle Public Library’s central branch is known for its eye-catching architecture and stunning top-floor views, and it also hosts events every day of the year. A couple blocks away, the Seattle Art Museum is home to edgy exhibitions and collections of historic art. If you prefer seeing your art in nature, take a wander through the museum’s Olympic Sculpture Park, which is northwest of Pike Place. When you’re ready for a hearty meal, head straight for Pier 54, where you’ll find Ivar’s Acres of Clams, a Seattle institution. Ivar’s has held down this prime real estate for more than 75 years, but the menu here is surprisingly fresh, thanks to the vision of Executive Chef Chris Garr. Over the past decade, Chef Garr has revamped the seafood shack’s longstanding menu, finding countless opportunities to remove gluten from recipes and add more sustainable seafood to the mix. Today, Ivar’s menu features almost exclusively wild-caught and local fish and seafood, ethically raised pork, and countless gluten-, soy- and peanut-free dishes. Share an order of the perfectly crunchy gluten-free calamari, which is cooked in a separate fryer and comes with a zesty dipping sauce. Try a bowl of the wonderfully rich and creamy smoked salmon chowder that is made with a rice flour roux. Save plenty of room for the main course, though. You won’t want to miss Ivar’s halibut, which comes wrapped in smoky bacon that takes this dish to a whole new level. Seattle has a long history as a center of industry, but the city’s industrial neighborhoods have changed significantly over the years. Just south of Seattle’s downtown, the city’s SoDo neighborhood has put a trendy spin on this once-gritty area. You’ll visit the north end of SoDo if you catch the Seahawks or Sounders play at CenturyLink Field or if you see a Mariners game at Safeco Field. If you want to try the neighborhood’s best food and drink, however, head further south. For a quick bite, seek out I Love My GFF. This roving food cart sticks to a weekly schedule, and certain days of the week you’ll find it outside the Starbucks headquarters in SoDo. During the summer, you’ll also find owner Andrea Ramos Moore and her team serving up gluten-free eats at the First Hill Farmers Market, the Queen Anne Farmers Market and other spots around town. No matter where you find I Love My GFF, the menu will always be completely gluten free. Both the Fiesta Bowl and the Sunshine Bowl, the two main menu items, have quinoa bases piled high with beans, seeds, veggies, chicken and cheese. The team can accommodate vegetarian, vegan and Paleo requests, and you can’t go wrong with either bowl. This is healthy fast food at its finest and one of the tastiest food truck meals I’ve had anywhere. Firmly anchored in SoDo, Ghostfish Brewery takes a decidedly new approach to beer. Rather than brewing with barley or wheat, Ghostfish relies on millet, buckwheat, rice and a range of other gluten-free ingredients. To say that the Ghostfish team is creative would be an understatement. Though the dedicated gluten-free taproom has been open for just over two years, Brewmaster Jason Yerger has already produced nearly 200 different gluten-free brews. If you’ve been less than impressed by mass-produced gluten-free beers in the past, the varieties and flavor profiles at Ghostfish will blow you away. When visiting Ghostfish, you’ll find flagship brews like Vanishing Point Pale Ale and Meteor Shower Blonde Ale on tap. Depending on the season, you might also find Kai Dog Red IPA, Co-Conspirator Apricot Sour Ale, Watchstander Stout or countless other creative brews on draft. All Ghostfish beers are gluten free, and the brewery also serves up cider from other dedicated facilities. If you work up an appetite after sampling a flight or two, Ghostfish has you covered. The brewery serves up everything from pub snacks such as beer-battered pickles to small plates like street tacos to full plates, including bratwurst and pulled pork sandwiches. On weekends, you can even indulge in chilaquiles or the Country Burger Benedict. All of the comfort food here is gluten free, making Ghostfish a must for any Seattle visit. Seattle offers tons of opportunities for getting away from the urban sprawl. You can hop on a ferry to scenic Bainbridge Island, spot orcas off the coast of the nearby San Juan Islands or take a hike up Mount Rainier, all within a few hours of the city. But if you’re short on time like I usually am, you’ll find plenty of places to escape just a few minutes from the city center. Grab a bike or hop in a car, and you can be in Ballard or Fremont in just 10 or 15 minutes. Located northwest of downtown Seattle, Ballard blends its Nordic history with hip dining and shopping. Peek into some of the unique boutiques along Old Ballard Avenue, grab a table at one of the city’s hottest new restaurants, or shop for local produce at the year-round farmers market. Just south of Ballard, Fremont is home to the extensive Fremont Sunday Market, some of my favorite coffee at the Fremont Coffee Company and one of Seattle’s best gluten-free bakeries. Flying Apron makes a mind-boggling range of sweet and savory goodies that are both gluten free and vegan, which makes this bakery a smart choice for just about everyone. Make sure you arrive hungry, because you’re probably going to want to order one of everything. My veggie-packed calzone was piping hot and big enough for two people, but that didn’t dissuade me from ordering an enormous, gooey cinnamon roll to complete the meal. My only regret was not loading up a to-go bag with gluten-free donuts and pastries to enjoy later. Flying Apron’s motto is, “It’s not about what you can’t eat,” and it shows. Whether you’re looking for something that’s just gluten free or a treat that’s also corn free and soy free, you won’t feel like you’re missing out. From world-class attractions to outdoor adventures to fantastic food, Seattle truly has it all. Whether you’re planning a quick getaway to see what the Emerald City is all about or you want to dig in and find some new favorite things to do and eat, Seattle won’t disappoint.